Mutu has described women as “barometers,” innately vulnerable to the fluctuation of social and cultural norms. Here the vestiges of combat (political, cultural, and perhaps literal) have actually scarred and broken her. 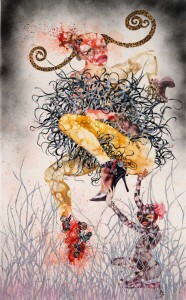 Yet Mutu has reconstructed this woman into something elegantly disordered, mythical and powerful, rising up, leaving the viewer to reconsider the notion of the feminine ideal. The image to the left entitled, ‘One Hundred Lavish Months of Bushwack’, shocks and excites. It is defiant and self created; it might be a spirit animal for me (I’m still celebrating in my head last Tuesday’s victories while recognizing the great work required to fulfill any hope of a progressive agenda). If you’re unfamiliar with her work, Mutu’s lecture for MOMA’s Feminist Future Symposium in 2007 is a great place to start. She even does a shout out at the end to notable diverse voices underrepresented atable to find some time to listen to her lecture here about her work.